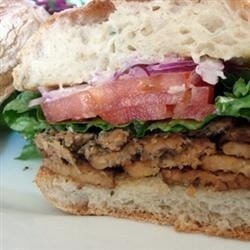 "This is an excellent way to eat tempeh!" Heat the oil in a large skillet over medium heat. Add the tempeh slices and cook 3 to 4 minutes, or until they start to brown. Pour in half of the liquid aminos and cook for 1 minute. Flip the tempeh slices and cook until toasted, 3 to 4 more minutes. Pour in the remaining liquid aminos and cook for 1 minute. Remove the tempeh, and set it aside. In the same skillet, heat the remaining oil over medium heat. Cook the onion, green pepper, and jalapeno until the vegetables have softened, 4 to 5 minutes. Spread each pita half with 1 teaspoon soy mayonnaise. Stuff each pita with several slices of tempeh, peppers and onions, and a piece of Swiss cheese. Toast the sandwiches in a toaster oven for 2 minutes or until the cheese has melted. The only thing that I changed was that used mini sweet peppers and it turned out delicious!! !